SOFTENS BEARD & SMOOTH'S COARSE HAIR - Leaves your beard soft to the touch and smooths coarse facial hair. Keeps your beard knotless and more manageable. Are you sick and tired of your prickly beard hurting your lady? It's time for you to put the "Too prickly!" and "Too scratchy!" complaints to bed. SOOTHES ITCH, RIDS BEARDRUFF & PRODUCES A RICH, HEALTHY SHINE - Relieves persistent beard itch and gets rid of beard dandruff by completely moisturizing your beard and the skin beneath. 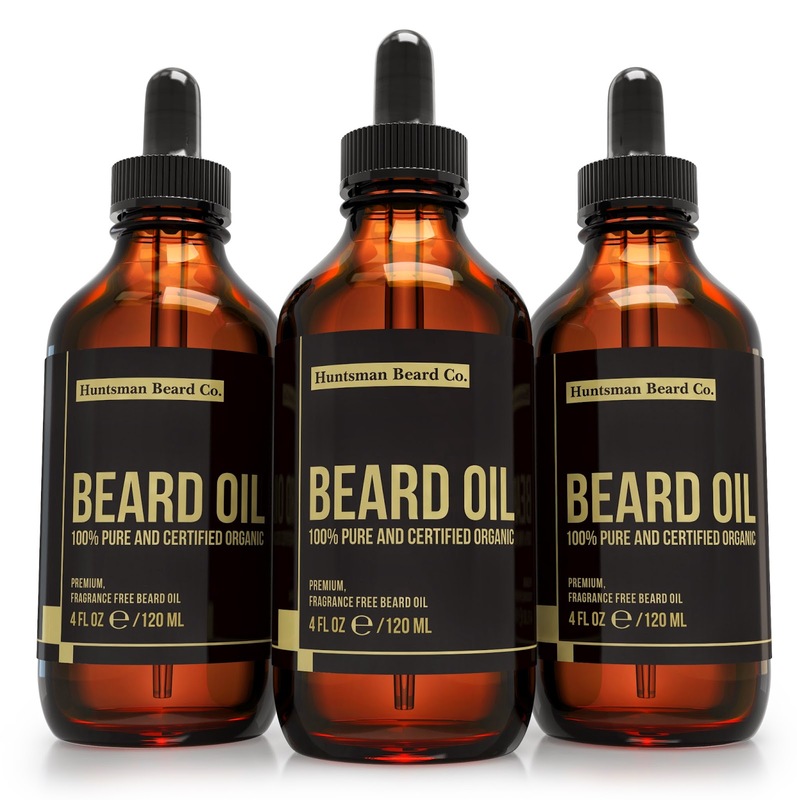 Gives your beard a luxurious, healthy shine without leaving it feeling greasy or oily. FOUR TIMES LARGER THAN MOST - Our beard oil contains the finest, all natural ingredients and is 4 times the size of most other bottles. 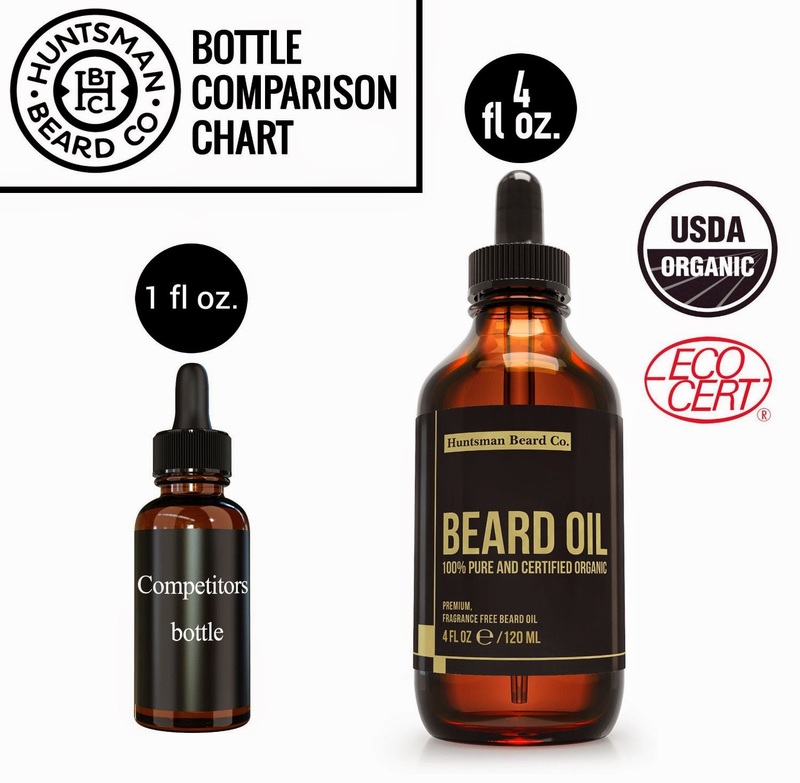 You deserve the best value and your beard deserves the best oil. FRAGRANCE FREE & 100% CERTIFIED ORGANIC - Perfect for the man who doesn't want to smell like a fruit basket. Our beard oil is 100% pure and certified organic, USDA and Ecocert approved. Never tested on animals. Contains Organic Jojoba and Argan Oil only. Huge 4 oz. bottle which is 4 times the size of most, yet it's not 4 times the price. ULTIMATE VALUE... FOUR TIMES THE SIZE OF MOST - Our beard oil contains the finest ingredients, yet remains ultra affordable for the urban man. LIFETIME MONEYBACK GUARANTEE - Backed by the Huntsman Beard Co. Lifetime Guarantee. - Relieves Pesky Beard Itch - By soothing rogue hair. - Gets Rid of Beardruff - By effectively moisturizing dry skin. - Softens Coarse Hair - No more complaints of a "Prickly" or "Scratchy" beard & mustache. - 100% Pure & Certified Organic - Only the finest are used in our beard oil. - Scent Free - For men who don't want to smell like a fruit basket. Without feeling greasy or oily! And before you know it, you'll be enjoying a silky soft & knot free, easy to manage mane! Backed by our Lifetime No-Hassle Money back Guarantee! I gave The Huntsman Beard Company Beard Oil to my son to use on his beard. It comes in a very nice 4oz size tinted glass bottle with a dropper applicator for easy application and no waste. My Son likes to keep his facial hair groomed. I noticed after he grooms his face the skin underneath looks dry. I thought this would be the perfect solution. He likes the bottle having a nice, easy to use dropper so you only get a few drops at a time to comb or brush into the beard. He did this for several days and I really noticed how much nicer his skin and beard looked. Both looked healthy and he said his face was not itchy anymore. Perfect results and easy to include in your "manscaping" routine!